Liftware Steady Fork Attachment by Liftware at Get Cheap Health Insurance. MPN: LW-1003. Hurry! Limited time offer. Offer valid only while supplies last. Liftware Steady is an electronic stabilizing handle and a selection of attachments that include a soup spoon, everyday spoon, spork and fork. Liftware Steady is an electronic stabilizing handle and a selection of attachments that include a soup spoon, everyday spoon, spork and fork. Liftware Steady is designed to help people with hand tremor, usually related to Parkinson's disease and essential tremor eat more easily. The Liftware Steady fork attachment is designed to work with a Liftware Steady handle, sold separately as part of the Liftware Steady Starter Kit. Not compatible with the Liftware Level handle. Liftware Steady stabilizing handle required. The fork connects to a Liftware Steady handle (sold separately as part of a Liftware Steady Starter Kit) to help people with hand tremor eat more easily. 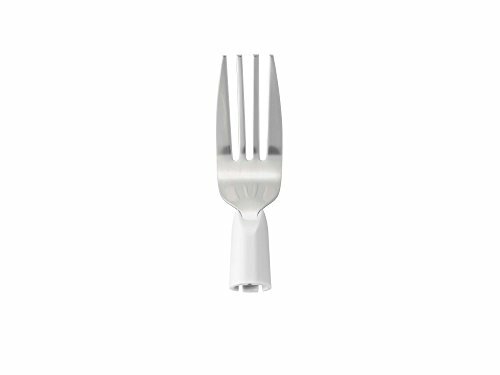 The Liftware fork attachment has a deep scooped profile to hold more food. Suitable for use with foods such as salads and pasta, or anything else commonly eaten with a fork. Ships for free when ordered together with a Liftware Steady Starter Kit. Not compatible with the Liftware Level handle. If you have any questions about this product by Liftware, contact us by completing and submitting the form below. If you are looking for a specif part number, please include it with your message.